Mainstream NUMA and the TCP/IP stack: Part I. One of the intriguing aspects of the onset of the many-core processor era is the necessity of using parallel programming techniques to reap the performance benefits of this and future generations of processor chips. Instead of significantly faster processors, we are getting more of them packaged on a single chip. To build the cost-effective mid-range blade servers configured in huge server farms to drive today’s Internet-based applications, the hardware manufacturers are tying together these complex multiprocessor chips to create NUMA architecture machines. There is nothing the matter with NUMA – machines with non-uniform memory access speeds – of course, other than the fact that they introduce complex, hardware-specific programming models if you want to build applications that can harness their performance and capacity effectively. What is decidedly new is the extent to which previously esoteric NUMA architecture machines are becoming mainstream building blocks for current and future application servers. For the connected applications of the future, our ability to build programming models that help server application developers deal with complex NUMA architecture performance considerations is the singular challenge of the many-core era. Let’s start by considering what is happening to the TCP/IP software stack in Windows to support high speed networking, which is depicted in Figure 1. 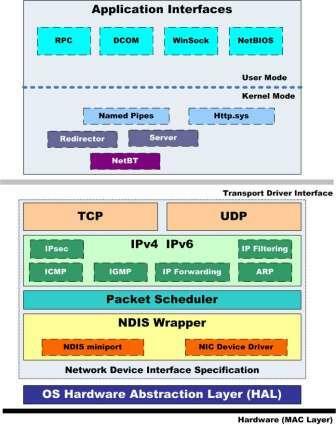 The Internet Protocol (IP) and the Transmission Control Program (TCP) are the standardized software layers that sit atop the networking hardware. The Ethernet protocol is the pervasive Media Access (MAC) Layer that segregates the transmission of digital bits into individual packets. Performance issues with Ethernet arise due to the relatively small size of each packet. The Maximum Transmission Unit (MTU) for standard Ethernet sized packets is 1500 bytes. Any messages that are larger than the MTU require segmentation to fit in standard sized Ethernet packets. (Segmentation on the Send side and reassembly on the Receive side are functions performed by the next higher level protocol in the stack, namely the IP layer.) Not all transmissions are maximum sized packets. For example, the Acknowledgement (ACK) packets required and frequently issued in TCP consist of 50-byte packet headers only, with no additional data payload. On average, the size of packets circulating over the Internet is actually much less than the protocol-defined MTU. The performance problems arise because in a basic networking scheme, each packet received by the Network Interface Card (NIC) delivers a hardware interrupt to the host processor, requiring in turn some associated processing time on the host computer to service that interrupt. The TCP/IP protocol is reasonably complex, so the amount of host processing per interrupt is considerable. As transmission bit rates have increased from 10 Mb to 100 Mb to 1 Gb to today’s 10 Gb NICs, the potential interrupt rate rises proportionally. The host CPU load associated with processing network interrupts is a long-standing issue in the world of high speed networking. The problem has taken on a new dimension in the many-core era because the network interface continues to get faster, but processor speeds are no longer keeping pace. A back-of-the envelope calculation to figure out how many interrupts/sec a host computer with a 10 Gb Ethernet card potentially needs to handle should illustrate the scope of the problem. The Ethernet wire protocol specifies a redundant coding scheme that encodes successive eight bits of data with two bits of error correction data. This is known as 10/8 encoding. With 10/8 encoding, a 10 Megabit Ethernet card has a nominal data rate of 1 Megabyte/sec, a 100 Mb Ethernet NIC transmits data at a 10 MB rate, etc. Similarly, the 10 Gb Ethernet card has the capacity to transmit application data at 1 GB/sec. To understand the rate interrupts need to be processed on a host computer system to sustain 1 GB/second throughput with Ethernet, simply divide by the average packet size. To keep the math easy, assume an average packet size is 1k or less bytes. (This is not an outlandish assumption. A large portion of the Receive packets processed at a typical web server are TCP ACKs; these are minimum 50 byte headers-only packets. Meanwhile, http Get Requests containing a URL, a cookie value, and other optional parameters can usually fit in a single Ethernet 1500-byte packet -- in practice, the cookie data that most web applications store is often less than 1 KB.) Assuming an average packet size of 1 KB, a 10 Gb Ethernet card that can transfer data at 1 GB/sec rate has the capability of generating 1 million operations/sec on your networking server. Next, assume there is a 1:1 ratio of Send:Receive packets. If 50% of those are Receive operations, then the machine needs to support 500K interrupts/sec. which easily exceeds the capacity of a single CPU in the many-core era. If these network interrupts are confined to a single processor, which is the way things worked in days of yore, host processor speed is a bottleneck that will constrain the performance of a high speed NIC. I was also careful to shut down all other networking applications on my machine for the duration of the test. a requirement for 100 GHz of host processing power to perform the TCP/IP processing for a 10 Gb Ethernet card running at its full rated capacity. According to the xperf documentation, the LATENCY flags request trace data that includes all CPU context switches, interrupts (Interrupt Service Routines or ISRs) and Deferred Procedure calls (DPCs). As explained in , Windows uses a two-step process to service device interrupts. Initially, the OS dispatches an ISR to service the specific device interrupt. During the ISR, further interrupts by the device are disabled. Ideally, the ISR performs the minimum amount of processing time possible to re-enable the device for interrupts and then schedules a DPC to finish the job. DPCs are dispatched at a lower priority than ISRs, but above all other functions in the machine. DPCs execute with the device re-enabled for interrupts so it is possible for the execution time of the DPC to be delayed because it is preempted by the need to service a higher priority interrupt from the NIC (or another device). Gathering the xperf data while the NTttcp test was running lowered the network throughput only slightly – by less than 2%, additional measurement noise that can safely be ignored in this context. The kernel trace events requested are basically being gathered continuously by all the diagnostic infrastructure in Windows anyway. The xperf session merely gathers them from memory and writes them to disk. The disk was otherwise not being used for anything else during this test and there was an idle CPU available to handle the tracing chores. The overall performance impact of gathering the trace data was minimally disruptive in this situation. I then loaded the trace data from the .etl file and used the xperview GUI application to analyze it. See Figure 2. Figure 2. xperview display showing % CPU utilization, % DPC time, and % Interrupt time, calculated from the kernel trace event data recorded during the NTttcp test execution. Figure 2 shows three views of the activity on CPU 0 where all the networking processing was performed. The top view shows overall processor utilization at close to 100% during the TCP test, with an overlay of a second line graph indicating the portion specifically associated with DPC processing, accounting for somewhere in excess of 60% busy. 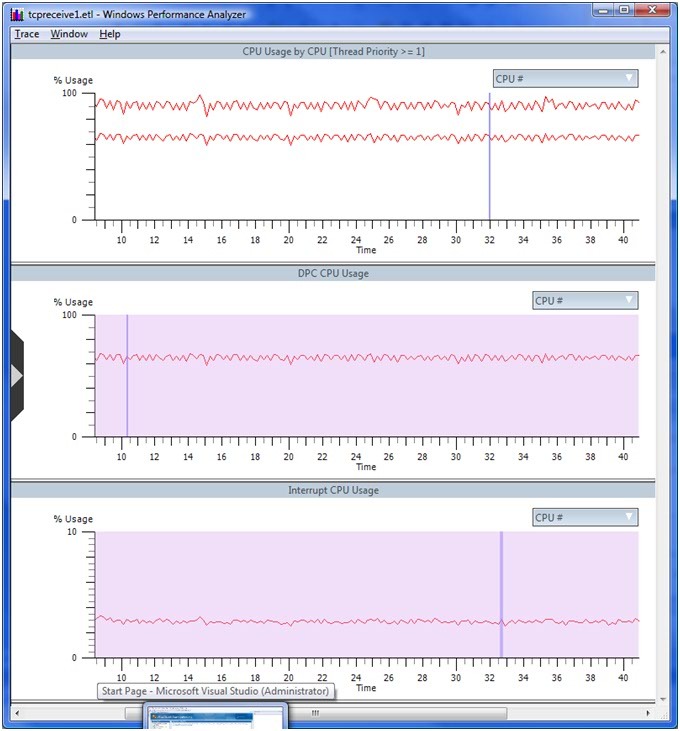 The DPC data is broken out and displayed separately in the middle graph, and the Interrupt CPU time is shown at the bottom (a little less than 4%). xperfview allows you to display a Summary Table that breaks out Interrupt and DPC processor utilization at the driver level, sorted by the amount of processor time spent per module. For the DPCs, we see the following. Table 1. xperfview Summary Table display showing processor utilization by DPC. Confirming my back-of-the-envelope calculation presented earlier, xperf trace data indicates the average duration of an ndis.sys DPC used to process a network interrupt was 75 μsecs. The total amount of time spent in DPC processing was approximately 32 seconds of the full trace, which lasted about 52 seconds, corresponding to slightly more than 61% busy on CPU 0. Table 2. xperfview Summary Table display showing processor utilization by ISR. which remains a formidable constraint, considering the speed of current processors. Finally, I drilled in the processor utilization by process, which showed utilization by the NTttcp process, whose main processing thread was also affinitized to CPU 0, at the receiving end of the interrupt responsible for an additional 11% CPU busy. Allowing for OS scheduling and other overhead factors, these three workloads account for the 100% utilization of CPU 0. Table 3. xperfview Summary Table display showing processor utilization by process. The point of this set of measurements and calculations is not characterize the network traffic in and out of a typical web server, but to understand the motivation for recent architectural changes in the networking stack – both hardware and software – to allow network interrupts to be processed concurrently on multiple processors. Those architectural changes are the subject of Part II of this blog. Part II of this article is posted here. "With 10/8 encoding, a 10 Megabit Ethernet card has a nominal data rate of 1 Megabyte/sec, a 100 Mb Ethernet NIC transmits data at a 10 MB rate, etc. Similarly, the 10 Gb Ethernet card has the capacity to transmit application data at 1 GB/sec. this is rather wrong assumtion. One 1 Gbps ethernet link generally have a line rate of 1.25 Gbps to give 1 Gbps( 1000/8 = 125 GB/sec). Though because of overhead of ethernet frame actual data throughput to higher layer will be less. And secondly, your instruction calculation is less convincing. 2.2 GHz does not mean 2.2 Giga instruction, it is just that many clock ticks. One instruction can take more than one tick. On the nominal data rate of an Ethernet link using 10/8 encoding, I am going to hold my ground. But you are certainly correct when you ask me to account for the Ethernet preamble, postamble, and the header itself. Ethernet is actually not capable of delivering the full nominal data rate to the next higher level protocol. I deliberately neglected that detail here, but it is an important detail that people are prone to overlook. On the instruction execution rate vs. clock cycle rate, your comment pushed me to make a correction I should have made earlier. If you double-check above, I changed "instructions" to "clocks" (or cycles) in equation 2 & 3 because that is clearly what I was measuring here. I should not have been so free about mixing up instruction execution rate and clocks, so thank you for making me clarify that. In this article I wanted to avoiding discussing the Intel microarchitecture. But your question invites me to deal with it a little bit. Please understand that in writing "instructions" instead of "clocks" in Equations 2 & 3, I was deliberately being conservative. My expectation for this workload is that the CPI (cycles per instruction) would actually be less than 1, although I admit I did not go to the trouble of measuring that in this case. The current microarchitectecture aims to do better than 1 CPI. The processor does not execute native x86 or x64 instruction directly. It translates native instructions into micro-ops and these can be executed out of order & in parallel. The microarchitecture does ensure that instructions are "retired" in their original sequence. (The most important performance metric is the rate that native x86 Instructions are "retired" per sec.) With Intel processors today, the pipeline depth is model-dependent (and more like 10-20 cycles per instruction), but they are all capable of retiring as many as 3 or 4 instructions per clock cycle. For critical code paths like the TCP/IP stack in Windows, it is safe to assume that you are executing optimized code that will retire more than 1 instruction per clock. That is why I felt safe using "instructions" without further explanation in this context, but "clocks" or "cycles" is still better. Thanks for your clarifications. I just wanted to raise clock vs Instruction issues and as you rightly pointed out these things are much dependent on cpu architecture and increasingly becoming complicated to calculate. "The IEEE 802.3z standard includes 1000BASE-SX for transmission over multi-mode fiber, 1000BASE-LX for transmission over single-mode fiber, and the nearly obsolete 1000BASE-CX for transmission over balanced copper cabling. These standards use 8B/10B encoding, which inflates the line rate by 25%, from 1000 Mbit/s to 1250 Mbit/s to ensure a DC balanced signal. The symbols are then sent using NRZ.."
Thanks for the correction & amplification on ethernet bit rates. The 1000BaseX standard is mainly for fiber connections where the nominal data rate is 1 GB sec. "The data is transmitted over four copper pairs, eight bits at a time. First, eight bits of data are expanded into four 3-bit symbols through a non-trivial scrambling procedure based on a linear feedback shift register; this is similar to what is done in 100BASE-T2, but uses different parameters." So, if I am reading this correctly, the nominal data rate is even less that what I reported in the test I ran. I will look into this a little more and correct the post accordingly. Thanks, again. Hey, what are a few megabytes/sec here and there between friends? I hope you noted that when you tested and saturated the CPU , IPsec was probably enabled and that took most of your CPU. Because otherwise, CPU utilization would have been much less. ( less than 25% on a mainstream dual core machine). Yes, your concern remain valid, stack should be able to take advantage of multi-cores present on the machine.